Advocare Spark energy drink is an energy drink powder sold by independent distributors. That means it’s a multi-level marketing product. Advocare positions their Spark drinks as a vitamin and amino acid supplement, but the ingredients are typical of most energy drinks. What is Advocare Spark drink? Advocare Spark is an energy drink powder that you mix with 8 fl.oz of water to make a nice energy drink. Spark comes in 10 different flavors, is sugar free and contains 120mg caffeine per serve. Each serving contains 15 calories. Each sachet contains a ¼ ounce of dry powder. When mixed as directed, one sachet makes the same amount of liquid as a typical 8-ounce can of energy drink. Advocare Spark is a powder energy drink that comes in a sachet. What are the ingredients in Spark? Like all energy drinks, you should consume Spark in moderation to avoid any potential side effects. How much caffeine is in a Spark? One sachet of Advocare Spark energy drink contains 120mg of caffeine. That is slightly more than the average 8 fl.oz can of energy drink, which typically contains 80mg of caffeine. It's also slightly more than the average cup of Joe, which contains around 100mg of caffeine. 120mg of caffeine is nothing to sneeze at, but it's certainly not in the same league as some other highly-caffeinated energy drinks. Advocare Spark contains slightly more caffeine than a regular cup of coffee. How often should you drink Advocare Spark? The packaging doesn't mention a daily limit, but common sense tells us that we should probably limit ourselves. "Pregnant or nursing women should consult a healthcare professional prior to use. Not for use by children or persons who are sensitive to caffeine or choline". 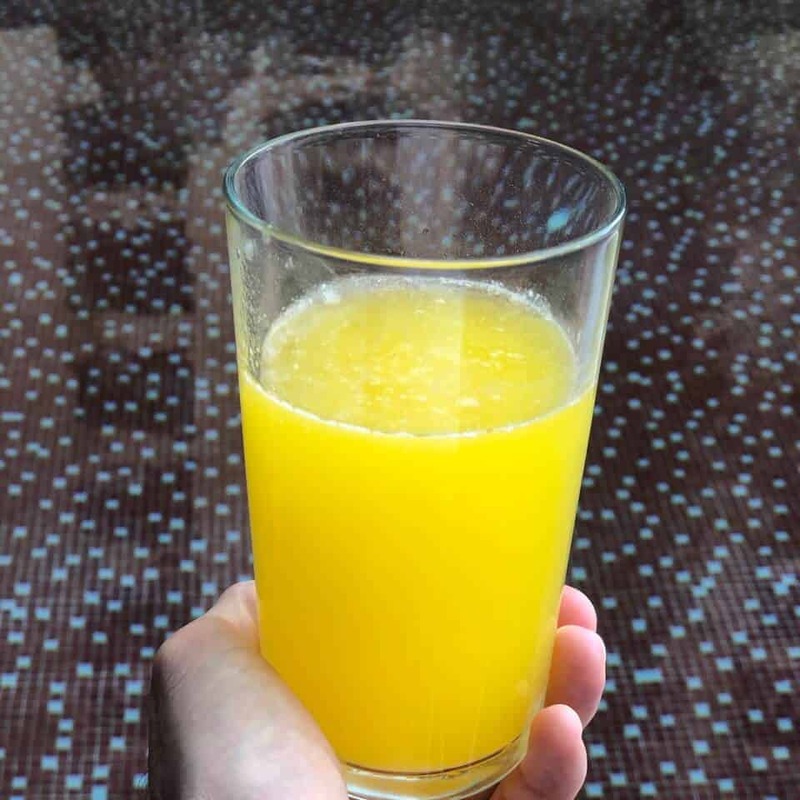 To get a definitive answer on how many Spark drinks you should drink in a day you should talk to your health professional. However, products with a similar amount of caffeine usually recommend no more than 2 daily. Keep in mind that Advocare Spark includes a bunch of different vitamins that are all way over the recommended daily values. That's for a single drink. So, perhaps you could argue that you should limit your daily consumption of Spark to one per day. Really, there's no health benefit to having so many water-soluble vitamins in Spark, and too much of them can lead to health problems. There are lots of great energy drinks out there, but we should drink all of them in moderation, including Spark. Is Advocare Spark sugar free? Yes, Advocare Spark is sugar-free. Instead of sugar, it is sweetened with Sucralose which is 400-700 times sweeter than sugar. Is there Splenda in Spark? Yes, Spark does contain Splenda aka Sucralose. The Spark packaging does not specify how much Splenda is included in a single sachet. Spark is sweetened with sucralose (Splenda) instead of sugar. Are Spark drinks a vitamin & amino acid supplement? Advocare markets Spark energy drink as a “vitamin & amino acid supplement”. The claims about amino acids are due to the inclusion of L-tyrosine, Glycine and L-carnitine. The problem is, these ingredients are only included in very small quantities. The main promise of L-tyrosine are its stress-fighting qualities. To have any meaningful impact in this regard, individuals should consume 45-68mg per pound of bodyweight. That means a 200 pound person should consume 9-13 grams of L-tyrosine to get any positive effects from this amino acid. How much L-tyrosine is in Spark energy drink? Just half of one gram. Nowhere near enough to get any benefits. How about Glycine, surely there’s plenty of that in Spark drinks? Glycine promises to help us get a good night sleep. Scientific research shows that 3 grams of glycine taken an hour before sleep is enough to get the benefits of a better sleep. Unfortunately, Spark energy drink strikes out again, with just 100mg of glycine. That’s about one-thirtieth the amount required to get any benefits from taking it. Lastly, we have L-carnitine which promises to reduce the effects of ageing and help to burn fat. Science shows that the minimum effective does to get any benefit from L-Carnitine is 500mg to 2 grams. How much of this great stuff is in Spark drinks? Wait for it…. Just 10mg. Around 1% of the amount that you need to get any benefit from it. What this all means is that Spark energy drink contains some fancy sounding amino acids, but none of them are present in anywhere near the amount required to derive any benefit from them. So, why on Earth would they so proudly boast “amino acid supplement” on the front of the Spark drink packaging if the levels of amino acids present in the drink are so low? I hope you didn’t fall for it. I wonder if the marketing team meeting looked something like this. 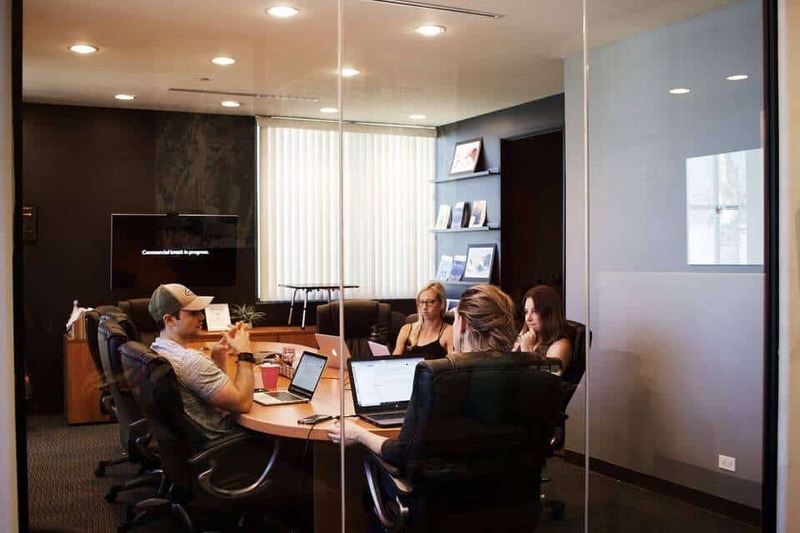 "...and then, if we print 'vitamin & amino acid supplement' on the sachets no one will ever check how much we actually include..."
As a multi-level marketing product, you may already know some people who are selling Spark energy drink. The problem is, if you buy Spark from a MLM reseller you will need to pay an unnecessarily high price so that they can make a profit. Those resellers are completely unnecessary in the transaction. To cut out the middleman, we suggest buying energy drinks directly from the manufacturer. You could try our delicious REIZE, or you could instead opt to pick up some Spark energy drink from Amazon. On Amazon, you can usually expect fast shipping and Spark drinks will cost you around $2.20 per drink shipped to your door. You can also find sellers of Spark on Ebay. Amazon and Ebay are both good options to buy Spark energy drink powder online. At a little over $2 per drink Spark energy drink is middle of the road for value. If you are considering buying Spark energy drink from a MLM reseller there is a good chance that they might ask you to pay a lot more. Spark energy drink is cheaper than ready to drink cans of energy drink like Rockstar, Monster and Red Bull, but is more than double the cost of REIZE. REIZE ships to your door for around $1 per drink. For a comprehensive review of Advocare Spark, check out this article. For the short version, see below. I paid $30.73 for a 14 pack of Spark drinks on Amazon. That’s $2.20 per drink shipped to my door. I was a little disappointed that I couldn’t find a mixed pack, so I got a 14 pack of mango strawberry flavor. 14 servings of the one flavor. Shipping was a bit slower than I was expecting. Perhaps they didn’t get around to packing my order for a few days, but I didn’t get my drinks until almost a week after I bought them. The package came with all of the sachets loosely packed in a polystyrene cover that was sticky taped together. The box that I saw on the Amazon listing was nowhere to be seen. This felt cheap and tacky. The Advocare Spark packaging was pretty ugly. What happened to the nice box that I saw in the Amazon listing?? I noticed the smell of the drinks as soon as I unwrapped the polystyrene box that they came in. It was surprising that I could smell anything at all considering the fact that all of the drinks were supposedly vacuum sealed in their sachets. It smelled like one of the sachets was slightly opened and some of the powder had spilled out onto the surrounding packaging, but I couldn’t see any evidence or stains from the powder. The smell remains a mystery. I opened a sachet and poured all of the powder into a cup and then poured 8 fl.oz cold water on top, as the packaging recommends. Then, I let it stand for a minute and gave the cup a couple of swirls to help the mixing process. 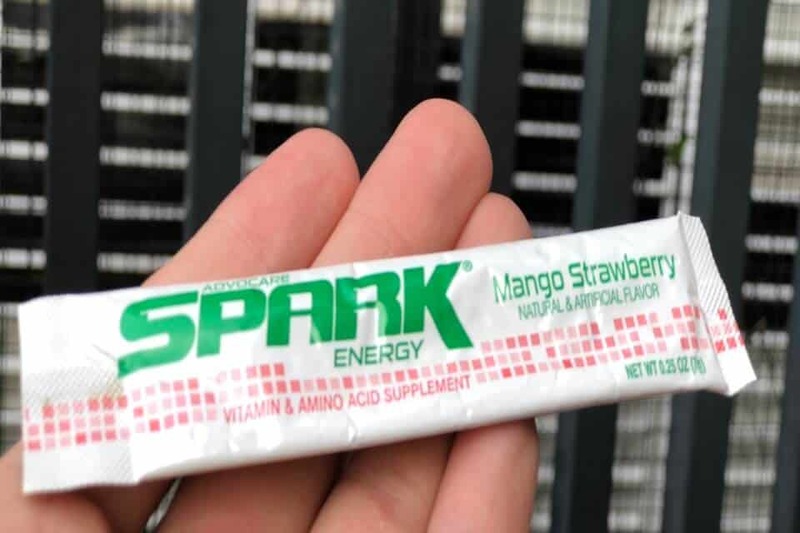 I was surprised to find that, unlike many other energy drinks, Spark mango-strawberry doesn’t fizz. It just sat there like a completely flat drink with no hint of carbonation. I don’t really mind either way, I just found it interesting that they have opted for a non-carbonated energy drink blend. More concerning was the fact that it didn’t mix very well. The surface of the drink looked like it had a very thin layer of ice across the top. Of course, it wasn’t actually ice. Instead, it appeared to be areas where the powder hadn’t mixed very well and had clumped together on the surface. The good news is that this thin surface layer disappeared after I had my first sip. I can see why most people give it the thumbs up. But again, when I got to the bottom of the drink the final mouthful of liquid hadn’t mixed properly and there were big ugly clumps of powder still stuck to the bottom of the cup. Advocare Spark energy drink powder doesn't mix very well. In terms of effects, I didn’t notice anything drastic, which I think is good. It’s hard to say that I got a noticeable energy boost, but I also didn’t feel any energy slump, including after lunch which was about an hour after I had the drink. Overall, I would say that I got a gentle energy boost that lasted for a few hours before I noticed that my energy levels were back to where they started, or perhaps a bit lower. I did notice a few effects that I didn’t really like though. Firstly, despite the really nice taste, there is a little bit of a “tinny” aftertaste. It’s not overpowering, but it’s enough to make you want to make sure that you’ve got some kind of a "chaser" drink handy to wash it down when you’re finished drinking your Spark energy drink. I was really thirsty for hours and hours after drinking Spark energy drink. This is probably just because of the 120mg caffeine. At least that’s my guess, but I just couldn’t stop drinking cold water all afternoon. My pee was bright yellow too. Probably because of all of the vitamins that are over and above the % daily requirements. 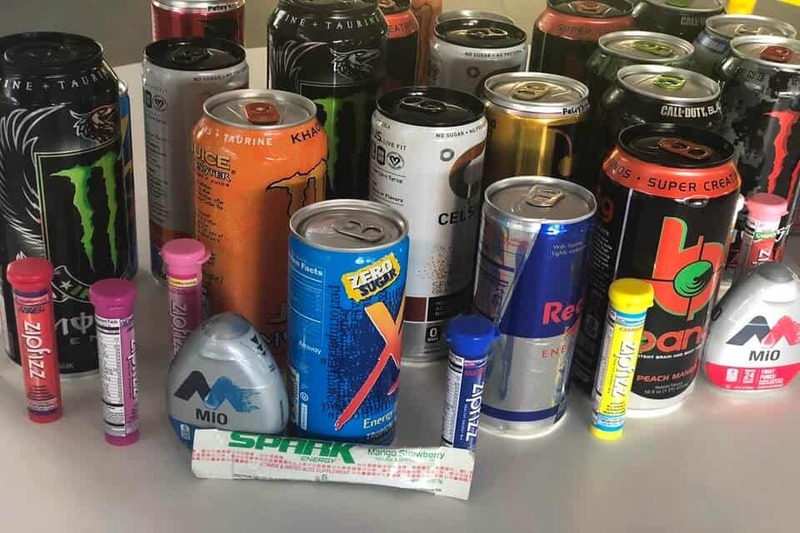 According to the packaging, there are 7 different vitamins in Spark energy drink that are each at least double the recommended daily intake percentage. That is completely unnecessary, because they are all water soluble, meaning that we pee out anything over and above 100% of our daily requirements. I guess that would explain my bright yellow pee. Something else that I noticed was my tummy felt a bit sick about 3 hours after I drank Spark energy drink. This wasn’t anything major, and it might have simply been a coincidence that I didn’t feel great, but I didn’t change anything else about my regular lunch and usually I feel fine. It seems like I'm not the only one that felt that way. Overall, I would say that Spark energy drink tasted great, albeit with a slightly unpleasant aftertaste. The effects were a gentle energy boost that lasted about 3 hours, with no noticeable crash. The main bad effect from drinking Spark energy drink was how thirsty I was for the rest of the day. Drinking a lot of water is a good thing, but I really craved cold water and probably drank at least 30 ounces of water throughout the course of the afternoon because I felt like I needed to. I give Spark energy drink a 7/10. It tastes good and delivers a gentle energy boost. Where it falls short is the poor mixing of the powder, how thirsty it made me and I’m also going to deduct a point for the ugly packaging that it arrived in. For $2.20 per drink I would have expected something a bit nicer. Is Spark good for weight loss? Drinking Spark drinks alone will not help you to lose weight. 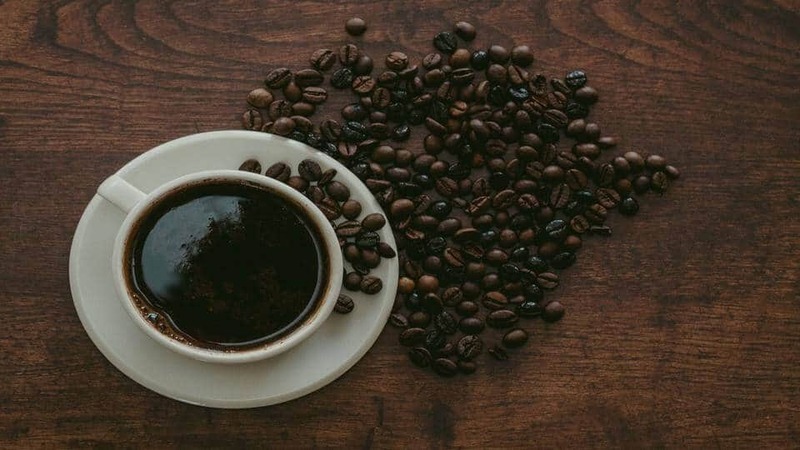 However, there have been plenty of studies show that consuming caffeine in combination with exercise can help you to burn more fat than if you did exercise without caffeine. Spark drink contains caffeine, so you could make an argument that drinking Spark AND exercising will have a beneficial impact on your weight loss efforts. But of course, most energy drinks contain caffeine, so we could say the same thing about most energy drinks too. There are lots of great energy drinks available. There are plenty of great products that are similar to Advocare Spark that you should probably know about. You might even want to consider Mio energy drops or caffeinated pills if cans and powders aren't your thing. If you are interested in a great value energy drink, check out REIZE which is a powdered energy drink, just like Spark and Zip Fizz. REIZE is also sugar free, contains even fewer calories than Spark, but ships to your door for around $1 per drink. That's less than half the price of Advocare Spark. If you love sugar-free powdered energy drinks, you’ll love REIZE. Give it a try today and you might just find that you prefer it to Spark.